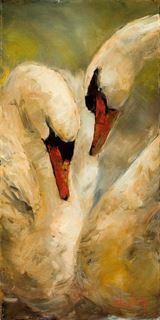 Intimacy| Painters Chair Fine Art in Coeur d'Alene, Idaho features original paintings, sculpture, prints and much more. Swans mate for life, are beautiful and fierce, and are graceful creatures. The romance they imply is intimate, and "Intimacy" appears to be a private conversation on love.